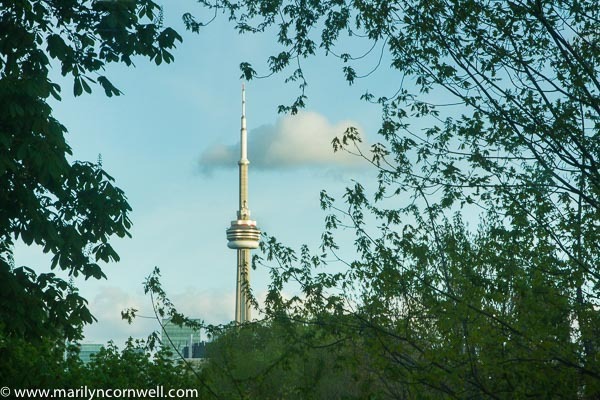 This is the view of the CN Tower from Koerner Hall. We're on the second floor so it makes the CN Tower that much more visible. The night-time view is excellent too. "In 1995, the CN Tower was classified as one of the Seven Wonders of the Modern World by the American Society of Civil Engineers. The CN Tower shares this designation with the Itaipu Dam on the Brazil/Paraguay border, the Golden Gate Bridge in San Francisco, the Panama Canal, the Chunnel under the English Channel, the North Sea Protection Works off the European coast, and the Empire State Building." It is great when we moved to Toronto in 1976, as the tower had just been built and was ever-present in our news, advertising, conversations and skyline as that was before the high-rise boom. I hadn't realized that the topping of the tower was an event that came close to tragedy. Here's the story on this. A friend of ours at the time was involved in the placement of a camera on the antenna, so I must have forgotten the story of 'Olga" the Sikorsky helicopter and the lurching of the crane on the top of the tower. The final piece of antenna was secured on April 2, 1975.